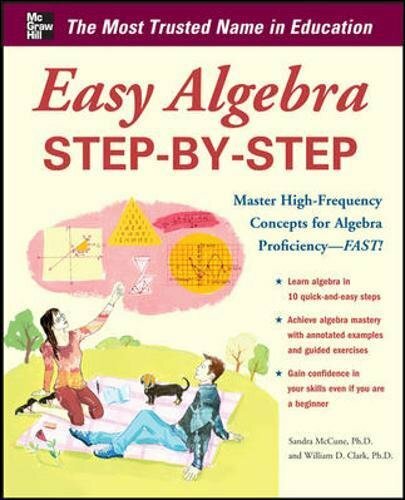 [PDF] Easy Algebra Step-by-Step (Easy Step-by-Step Series) | Free eBooks Download - EBOOKEE! Description: Take it step-by-step for algebra success! The quickest route to learning a subject is through a solid grounding in the basics. So what you wonâ€™t find in Easy Algebra Step-by-Step is a lot of endless drills. Instead, you get a clear explanation that breaks down complex concepts into easy-to-understand steps, followed by highly focused exercises that are linked to core skills enabling learners to grasp when and how to apply those techniques. This book features: Large step-by-step charts breaking down each step within a process and showing clear connections between topics and annotations to clarify difficulties Stay-in-step panels show how to cope with variations to the core steps Step-it-up exercises link practice to the core steps already presented Missteps and stumbles highlight common errors to avoid You can master algebra as long as you take it Step-by-Step! No comments for "[PDF] Easy Algebra Step-by-Step (Easy Step-by-Step Series)".